A genetically unique lineage of the Colorado River cutthroat previously thought to be extinct was rediscovered recently in southwest Colorado. Biologists from Colorado Parks and Wildlife searched streams in the San Juan River Basin and found eight pockets of the fish both on public and private lands. Previously, specimens of Colorado River cutthroats at the Smithsonian Institution were examined and found to be genetically unique to the San Juan River Basin. Biologists, however, thought the lineage had gone extinct. Hoping for the best, they decided to explore southwestern Colorado in search of the fish. 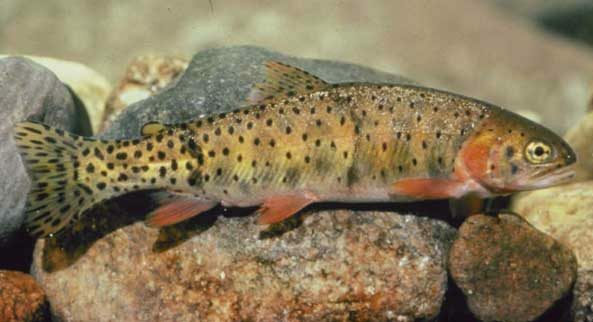 After an extensive search, they successfully located eight populations of the San Juan cutthroat. In 1989, fish of this lineage were put in headwater streams of Hermosa Creek to safeguard them. Almost three decades later, their story begins again. Not long after biologists found the fish, the 416 fire (a 54,129-acre wildfire that burned about 10 miles north of Durango) threatened the pockets of recently-discovered San Juan cutthroats. Ash and debris from wildfires can fill streams and kill fish, meaning this fire had the potential to wipe out the remaining members of the San Juan lineage. Biologists worked diligently to keep the population safe. They hiked in and rescued 30 fish, and then returned later for 28 more fish. These 58 trout were transported to a hatchery in Durango, where they will be bred. This should allow the population to continue growing. Their offspring, which could be ready for release by next year, will be restocked in the area. This is an exciting discovery on several levels. It’s of course wonderful that a strain of fish thought to be extinct is now back and thriving, but it also opens up the realm of possibilities for other species as well. This finding demonstrates the capabilities of biologists to use century-old specimens to address present-day issues, as well as the possibility that other extinct species may not actually be extinct. The yellowfin trout, for example, evolved in the Twin Lakes that were formed after the last ice age along the Arkansas River. While this species coexisted with other resident greenbacks in the same lakes, it disappeared after rainbows were introduced. Since 1903, the yellowfin has been presumed extinct. With breakthroughs like that of the San Juan cutthroat still making news today, it exciting to think of the possibility that other species like the yellowfin may also one day be rediscovered in the backcountry of Colorado. For additional resources on the San Juan cutthroat discovery, check out these posts by the Denver Post, Colorado Trout Unlimited, and Colorado Public Radio.